Cookies? Or bars? Why decide? 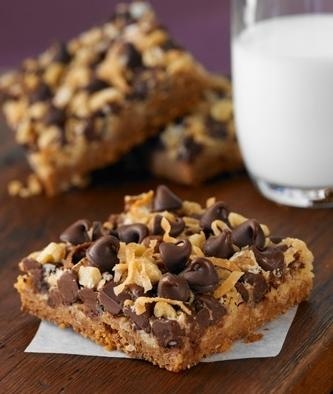 Allow us to introduce you to the love child of Mr. Cookie and Mrs. Bar, the Magic Cookie Bar… We think it will be the start of something beautiful. Combine graham cracker crumbs and butter in a small bowl. Press well into bottom of prepared pan. Pour sweetened condensed milk evenly over crumb mixture. Layer evenly with chocolate chips, coconut and nuts. Press down firmly with a fork. Loosen from sides of pan while still warm; cool on wire rack. Cut into bars or diamonds.